The Eagle of the Ninth is a six-part television adaptation of Rosemary Sutcliff's novel, better known to modern audiences from the 2011 film adaptation The Eagle. The adaptation was made for transmission on Sunday evenings in six half hour episodes. For years, the BBC used to show adaptations of classic children's novels on Sunday evenings during the autumn or in the lead up to Christmas, including The Chronicles of Narnia, The Borrowers and Merlin of the Crystal Cave. I used to love them, and looked forward to them as a child. The previous year, in autumn 1976, the BBC has transmitted its phenomenally successful adaptation of Robert Graves' novel I, Claudius for adults (definitely for adults) so it is not surprising that their choice of children's novel for 1977 was a Roman-set one. The use of accents, as in any show about Roman Britain, is interesting. The Romans here have proper plummy BBC accents. They all speak Received Pronunciation, which implies they are educated and associates them with the ruling classes. 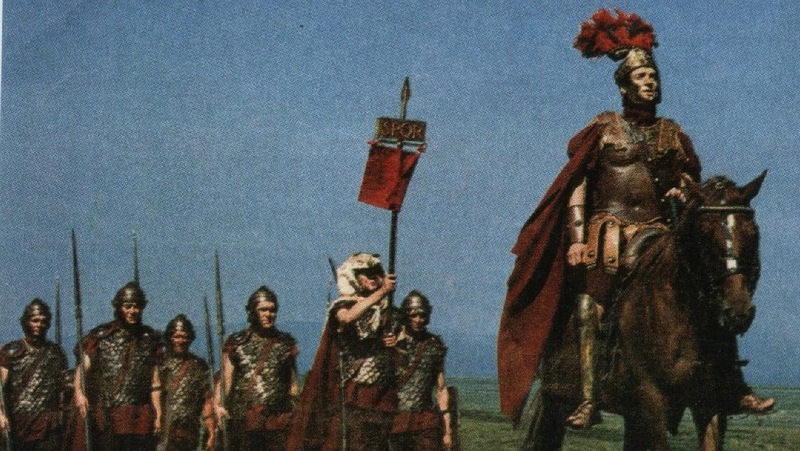 This goes for all the Roman troops, not just the commanders, which is unusual - even I, Claudius the year before used regional accents for lower ranking soldiers. The British, meanwhile, speak with a vaguely West Country accent (which is clearly being put on, badly, by the actors) in order to associate them with farming, with the land and with lower social classes (think Sam Gamgee's accent from The Lord of the Rings). This series follows the book much more closely than the 2011 film (unsurprisingly), so this whole first episode is basically set-up for the main part of the story. In this particular case, that works rather well for the story, as it allows Marcus' initial experience of Britain to stand as a story on its own, before following him out of the army in the rest of the series. I like the opening of the show, with a bit of black and white filming and a marching song that, while written to have vaguely Roman-appropriate lyrics, is clearly an old British-style marching song, all about leaving a girl behind and so on (see this rather wonderful Tumblr thread about different types of folk songs!). 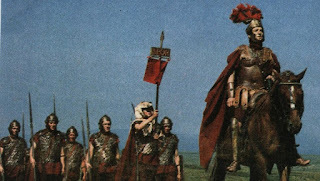 The Roman soldiers are therefore clearly presented to the audience as figures to identify with, singing the sort of marching songs British soldiers might have sung during the wars that were still very much in living memory (the children watching this in the 1970s may have had parents who fought in World War Two). The British, so far, are rather wilder. Despite being aimed at children and families, this show actually has a lot more action than I, Claudius. It obviously had a much bigger budget, as it includes actual outdoor filming. The battle scene is brief, shot in close-up and bloodless (the result of both budget and being aimed at a child audience), but we do get to see the testudo in action and it allows the series to do a bit more showing and a bit less telling. On the whole, though, like I, Claudius, the series relies heavily on small, indoor sets featuring a couple of theatrically trained actors crossly providing exposition to each other. I happen to be watching it now on an old, scratched, slightly fuzzy TV/DVD player that was a kind donation from my partner's cousins, that makes a weird clicking sound as the DVD plays. This is probably the closest modern way to replicate the experience of watching it in the 1970s! It's certainly far closer to our family TV from the 1980s than the elaborate projector screen system my partner has set up downstairs. Still, if modern eyes can get past the old-fashioned filming style and sometimes stilted delivery, the series is well worth a look. I imagine at some point it was broadcast here. I know I Claudius was. The lyrics for the song are from Sutcliff's original novel.